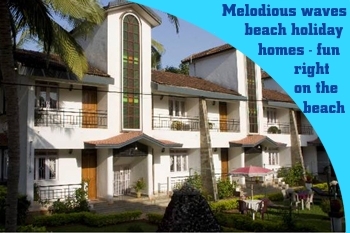 MELODIOUS WAVES BEACH HOLIDAY HOME is located at Dando-Candolim in a quiet by-lane just off the main Calangute-Candolim main road,a bare 5-MINUTE leisurely stroll to the relatively uncrowded and clean beach. CANDOLIM BEACH has a variety of marine adventure sporting activities like sky diving,water scootering,snorkeling OR just lolling on the beach and getting a wonderful suntan while reading your favorite authors. 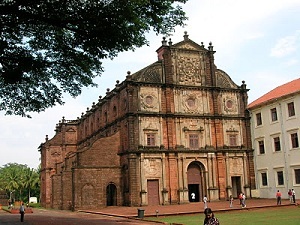 GOA also has ancient historical archaeological sites like BASILICA OF BOM JESUS, TAMDI SURLA, MANGUESHI TEMPLE, SAFA MASJID, etc. It is also an ORNITHOLOGIST's delight with rare migratory birds visiting the state when the season is favorable. Goans are a warm,hospitable, friendly people most of who speak and understand English. CULINARY DELIGHTS: Goa offers a wide and exotic variety of vegetarian and non-vegetarian cuisine from most corners of the world - Be it ITALIAN, GREEK, RUSSIAN, ISRAELI, THAI, ORGANIC HEALTH FOOD, CHINESE, TIBETAN and the vast variety of INDIAN and GOAN SEA FOOD delicacies, to name just a few. KFC, DOMINO's Pizza and other foreign franchisees also have a presence in Goa. ENTERTAINMENT: Goa has a vibrant and lively night life with DISCOS, KARAOKE BARS, CASINOS, SATURDAY NITE MARKETS apart from the Friday Mapusa Market, Wednesday Flea market at Anjuna, Go-karting, etc. Not to mention the annual International Film Festival (IFFI) and the feast of St. Francis Xavier whose relics in Goa are universally venerated. 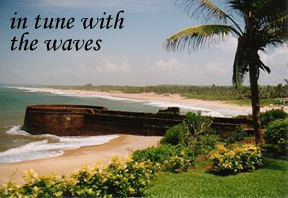 MELODIOUS WAVES HOLIDAY HOME beckons you to a pleasant experience that will linger in your memory long after you leave the shores of GOA!!!!!!! 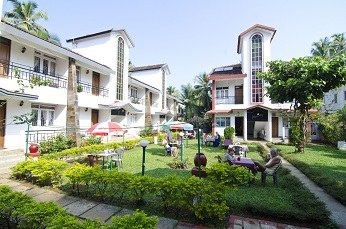 Breakfast, Soft drinks and Alcoholic Beverages are served at our open-air garden. Public transport is just down the road from the hotel. Vehicle/bike hire can be arranged. Local tours/sightseeing, river and backwater cruises can also be arranged. For any additional service, please contact our friendly receptionist at the front desk. 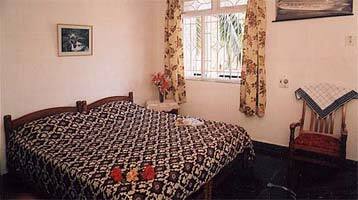 Spacious and clean rooms with marble flooring, twin balconies having total privacy and ideal for sunbathing. The balconies face the Arabian Sea and also the East side from which one can get a view of the rising sun, lush green lawns/garden and swaying palms. 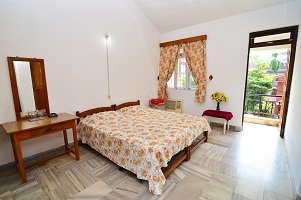 Each room has twin beds and attached bathroom/toilet with 24 hours hot/cold shower. 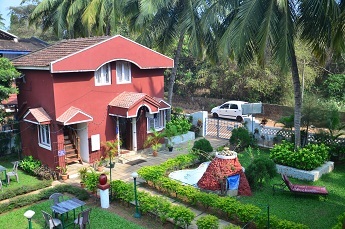 CHECK IN: 12 P.M. CHECK-OUT: 11 A.M.
Dando - Candolim, Bardez-Goa. 403 515 (India).